David purchased the land in 1996, with the intention to develop a permaculture property based on tree crop agriculture. His criteria when looking for a suitable site were for ‘food growing land next to a village with potential for a dam site’. There was also a family connection to the area as at that time his parents had a sheep farm 11 kms away. 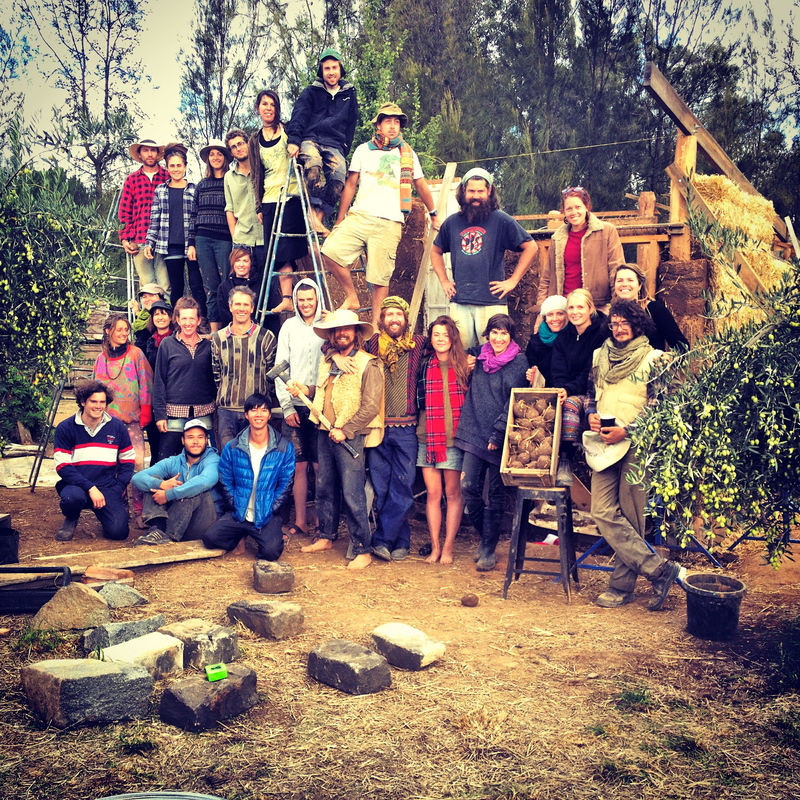 Any permaculture land development project is a combination of the landscape characteristics, and the characteristics of the people involved. People and place, or place and people. More about David’s background here. The site is a 200m x 400m rectangle at the west end of the Violet Town main street, made of alluvial soil from Long Gully and Honeysuckle Creeks. The parent material of the foothills just 2km away is Violet Town Volcanics. 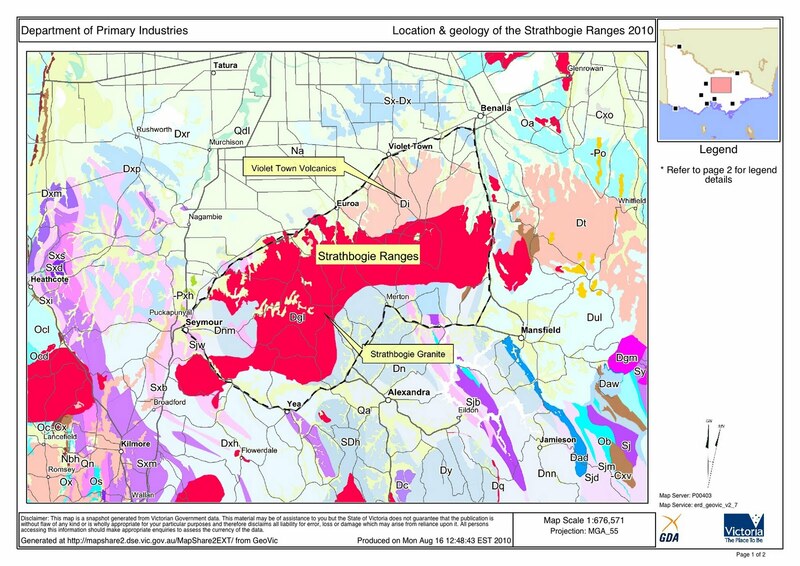 The property is at the beginning of the riverine floodplain that extends 600km downstream to the west and north west. 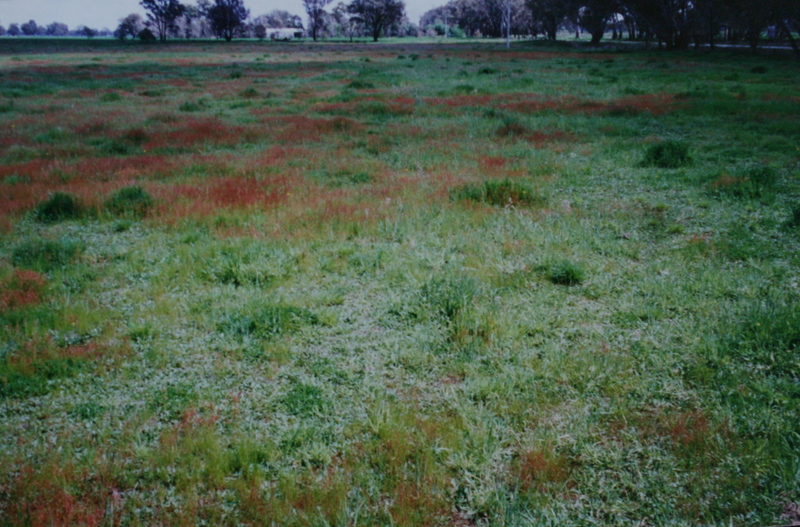 At purchase, June 1996, showing pasture species of sorrel, flatweed, and some cocksfoot tussocks. Long Gully creek, artificially excavated to take town storm water, just cuts across the South East corner of the property. 75% of the area is a slightly raised loam, the South East quarter is a slightly depressed flood way, heavier clay with some sandy seams through it. 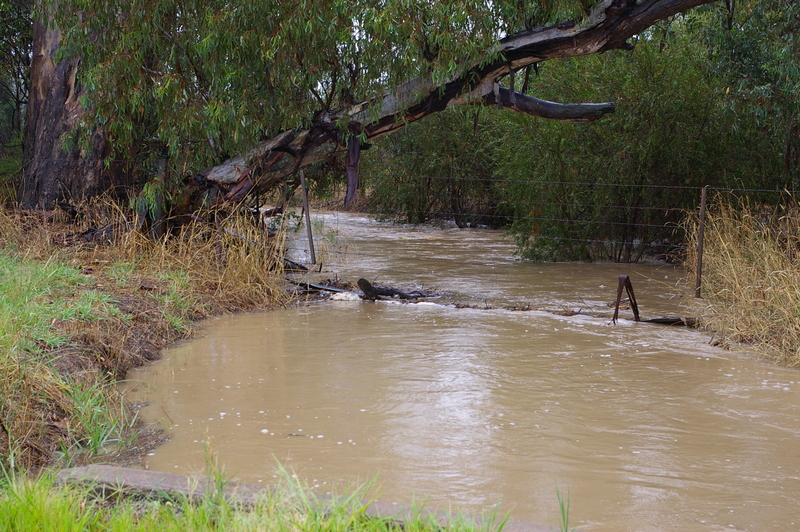 Long Gully Creek in flood, Mar 2012, flowing through fence into Murrnong. At this level the water flows out from the creek onto the floodplain. Floods like the one pictured above do not happen every year. 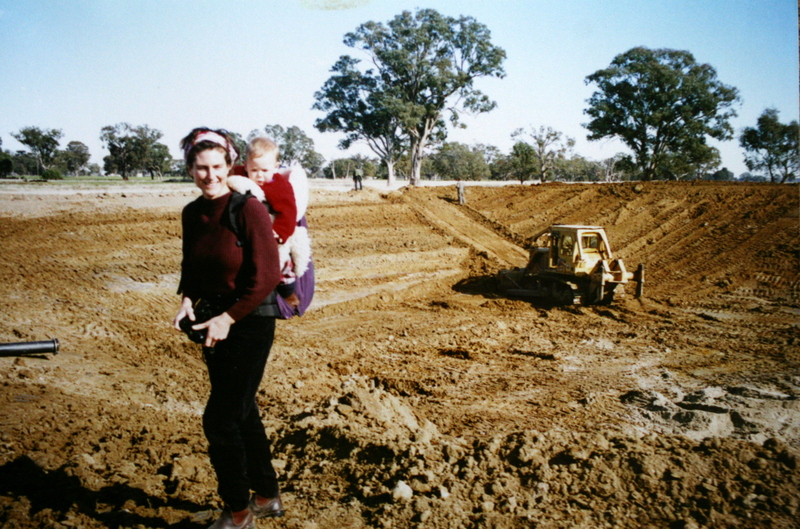 1996 site purchased, 200 Eucalypts and 20 fruit trees planted, chicken house and compost yards constructed. Site surveyed with dumpy level at a 25m x 25m grid, scale contour map produced. Start-up capital exhausted, tree planting/ design and development business commenced to give money to live on, and finance further farm development. Felix was born. 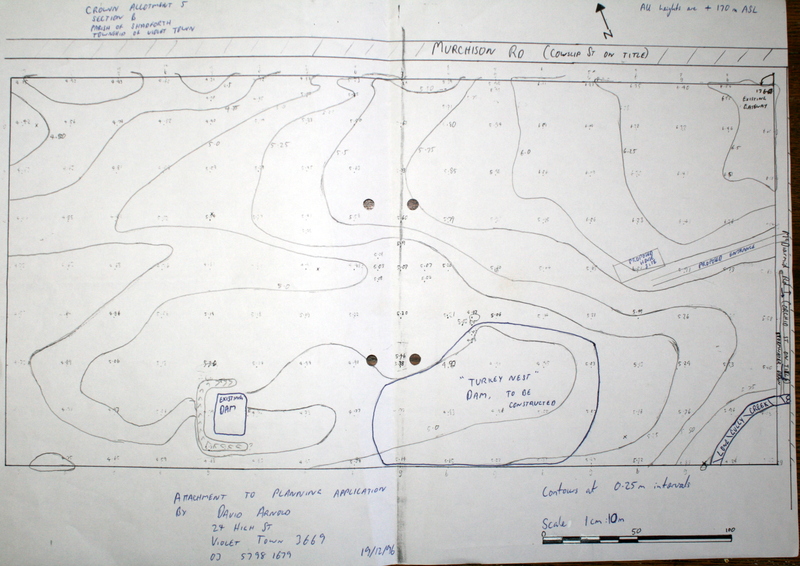 1997 dam constructed, land sub-soil plowed with Yeomans plow, rock dust mineral fertilisers spread – lime, crushed basalt rock dust from local quarry. Sea minerals fertiliser sprayed over pasture. 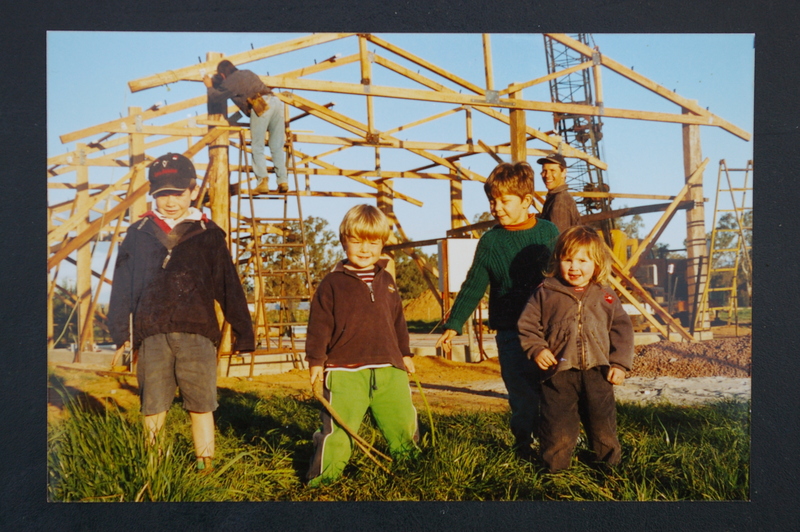 We moved to rent the house diagonally across from the farm gate, and began managing the farm as if it was the large backyard of the rented house. 1999 Landscape plan further developed. Grace was born. 2000 Winter. Irrigation network installed, main tree planting of entire property completed – orchard, Priola (alternate) rows of olive grove, low irrigation tree crops, shelter trees and shrubs, and wetland forest. Planting work and irrigation installation done by David with Jack Goutzoulas, Campbell Holt, and Matthew Lewis, who had been doing this kind of projects through David’s planning and contracting business. Farm building under construction, Aug 2003. Trevor Northey checking the frame with Bill Crocker’s restored 1946 Blitz gantry crane placing the truss. Felix and Grace, with cousins Ned and Joey, are in the foreground, with David behind.